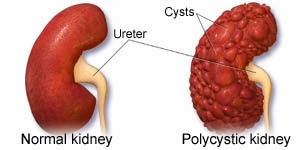 Polycystic kidney disease (PKD) is a genetic disorder characterized by the growth of numerous cysts in the kidneys. The cysts are filled with fluid. PKD cysts can slowly replace much of the mass of the kidneys, reducing kidney function and leading to kidney failure. The kidneys are two organs, each about the size of a fist, located in the upper part of a person's abdomen, toward the back. The kidneys filter wastes from the blood to form urine. They also regulate amounts of certain vital substances in the body. When PKD causes kidneys to fail--which usually happens only after many years--the patient requires dialysis or kidney transplantation. About one-half of people with the major type of PKD progress to kidney failure, i.e., end-stage renal disease (ESRD). PKD can cause cysts in the liver and problems in other organs, such as the heart and blood vessels in the brain. These complications help doctors distinguish PKD from the usually harmless "simple" cysts that often form in the kidneys in later years of life. Autosomal dominant PKD is the most common, inherited form. Symptoms usually develop between the ages of 30 and 40, but they can begin earlier, even in childhood. About 90 percent of all PKD cases are autosomal dominant PKD. Autosomal recessive PKD is a rare, inherited form. Symptoms of autosomal recessive PKD begin in the earliest months of life, even in the womb. Acquired cystic kidney disease (ACKD) develops in association with long-term kidney problems, especially in patients who have kidney failure and who have been on dialysis for a long time. Therefore it tends to occur in later years of life. It is not an inherited form of PKD. What Is Autosomal Dominant Polycystic Kidney Disease (PKD)? Autosomal dominant PKD is one of the most common inherited disorders. The phrase "autosomal dominant" means that if one parent has the disease, there is a 50-percent chance that the disease will pass to a child (see Genetic Diseases). At least one parent must have the disease for a child to inherit it. Either the mother or father can pass it along, but new mutations may account for one-fourth of new cases. In some rare cases, the cause of autosomal dominant PKD occurs spontaneously in the child soon after conception--in these cases the parents are not the source of this disease. Many people with autosomal dominant PKD live for decades without developing symptoms. 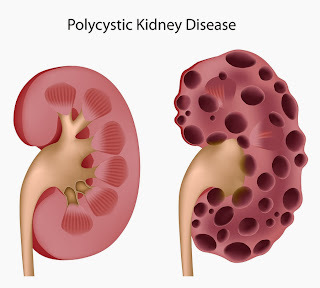 For this reason, autosomal dominant PKD is often called "adult polycystic kidney disease." Yet, in some cases, cysts may form earlier, even in the first years of life. The disease is thought to occur equally in men and women and equally in people of all races. However, some studies suggest that it occurs more often in whites than in blacks and more often in females than in males. High blood pressure occurs early in the disease, often before cysts appear. The cysts grow out of nephrons, the tiny filtering units inside the kidneys. The cysts eventually separate from the nephrons and continue to enlarge. The kidneys enlarge along with the cysts (which can number in the thousands), while retaining roughly their kidney shape. In fully developed PKD, a cyst-filled kidney can weigh as much as 22 pounds. How does autosomal dominant polycystic kidney disease progress? The disease develops very slowly and therefore symptoms and problems usually do not develop until adulthood. More and more cysts, sometimes up to several hundred, develop over the years. The size of most of the cysts ranges from the size of a pinhead to 2 cm in diameter. However, some can become much larger. The cysts press on the normal parts of the kidney and gradually replace much of the normal kidney tissue. In time, this affects the function of the kidney, as less and less normal kidney tissue is able to filter the blood. In many cases, the function of the kidneys eventually becomes so bad that end-stage kidney failure develops (see below). The affected kidneys get bigger. Sometimes they become as big as three to four times the normal size and can be felt when a doctor examines your abdomen. However, the extent of cyst formation and kidney damage can vary greatly from person to person. About one in three people with ADPKD get to the age of 70 without any serious kidney failure. What Are the Symptoms of Autosomal Dominant Polycystic Kidney Disease (PKD)? The most common symptoms are pain in the back and the sides (between the ribs and hips), and headaches. The dull pain can be temporary or persistent, mild or severe. How Is Autosomal Dominant Polycystic Kidney Disease (PKD) Diagnosed? To diagnose autosomal dominant PKD, a doctor typically observes three or more kidney cysts using ultrasound imaging. The diagnosis is strengthened by a family history of autosomal dominant PKD and the presence of cysts in other organs. In most cases of autosomal dominant PKD, the person's physical condition appears normal for many years, even decades, so the disease can go unnoticed. Physical checkups and blood and urine tests may not lead to diagnosis. The slow, undetected progression is why some people live for many years without knowing they have autosomal dominant PKD. Once cysts have formed, however, diagnosis is possible with imaging technology. Ultrasound, which passes sound waves through the body to create a picture of the kidneys, is used most often. Ultrasound imaging employs no injected dyes or radiation and is safe for all patients including pregnant women. It can also detect cysts in the kidneys of a fetus. More powerful and expensive imaging methods such as computed tomography (CT scan) and magnetic resonance imaging (MRI) also can detect cysts, but these methods usually are not required because ultrasound provides adequate information. CT scans require x rays and sometimes injected dyes. A genetic test has recently been developed and is commercially available to detect mutations in the PKD1 and PKD2 genes. This test can detect the presence of the autosomal dominant PKD mutations before cysts develop, but its usefulness is limited by the fact that the test cannot predict ultimate severity or onset of disease, and by the fact that no absolute cure is available to prevent the onset of the disease. A young person who knows of a PKD gene mutation may be able to forestall the disease through diet and blood pressure control. The test may also be used to determine whether a young member of a PKD family can safely donate a kidney to a parent. Anyone considering genetic testing should receive counseling to understand all the implications of the test. How Is Autosomal Dominant Polycystic Kidney Disease (PKD) Treated? Although a cure for autosomal dominant PKD is not available, treatment can ease the symptoms and prolong life. A doctor will first suggest over-the-counter pain medications, such as aspirin or Tylenol. For most but not all cases of severe pain, surgery to shrink cysts can relieve pain in the back and flanks. However, surgery provides only temporary relief and does not slow the disease's progression, in many cases, toward kidney failure. Headaches that are severe or that seem to feel different from other headaches might be caused by aneurysms, or swollen blood vessels, in the brain. Headaches also can be caused by high blood pressure. People with autosomal dominant PKD should see a doctor if they have severe or recurring headaches--even before considering over-the-counter pain medications. Patients with autosomal dominant PKD tend to have frequent urinary tract infections, which can be treated with antibiotics. People with the disease should seek treatment for urinary tract infections immediately, because infection can spread from the urinary tract to the cysts in the kidneys. Cyst infections are difficult to treat because many antibiotics do not penetrate into the cysts. However, some antibiotics are effective. Keeping blood pressure under control can slow the effects of autosomal dominant PKD. Lifestyle changes and various medications can lower high blood pressure. Patients should ask their doctors about such treatments. Sometimes proper diet and exercise are enough to keep blood pressure low. Because kidneys are essential for life, people with ESRD must seek one of two options for replacing kidney functions: dialysis or transplantation. In hemodialysis, blood is circulated into an external machine, where it is cleaned before reentering the body; in peritoneal dialysis, a fluid is introduced into the abdomen, where it absorbs wastes, and it is then removed. Transplantation of healthy kidneys into ESRD patients has become a common and successful procedure. Healthy (non-PKD) kidneys transplanted into PKD patients do not develop cysts. If other cysts develop in other parts of the body and cause symptoms and problems, then various other treatments may be needed. For example, if a liver cyst causes problems, sometimes it is possible to drain or remove it. Good control of blood pressure (and blood glucose level if you have diabetes). Medication to lower the cholesterol level - needed in many cases. Eat a healthy diet which includes a low salt intake. If CKD becomes severe (stage 4-5) you may need treatment to combat various problems and symptoms caused by the poor kidney function. If end-stage kidney failure develops (stage 5), you are likely to need kidney dialysis or a kidney transplant to survive. Also, people with stage 3 CKD or worse should be immunised against influenza each year and have a one-off immunisation against pneumococcus. People with stage 4 CKD should be immunised against hepatitis B. Should family members be screened (tested) for autosomal dominant polycystic kidney disease? So that you can have regular blood pressure checks to detect and treat high blood pressure as early as possible. This can make a difference to the long-term outlook. To know that if you do have ADPKD you have an increased risk of developing cardiovascular disease. Therefore, you may wish to make even greater efforts whilst younger to address any lifestyle issues such as smoking, exercise, obesity, etc. To make informed decisions about parenthood. Simply, to be aware of the problems that may occur in the future. However, having the diagnosis 'hang over you' before it causes any symptoms or problems can cause anxiety in some people. So, screening is not without potential harm. Genetic counselling may be appropriate in some cases. An ultrasound scan can usually detect ADPKD before it causes any symptoms. Until recently, screening by using an ultrasound scan was offered to family members at about the age of 20. However, some doctors recommend ultrasound scans every five years from late childhood until the age of 30. At this age, a clear scan virtually rules out the diagnosis of ADPKD. A specialised genetic blood test is sometimes used to screen for ADPKD in younger people before cysts are detectable by ultrasound scan. For example, this may be done in a younger relative of someone with ADPKD who has volunteered to be a kidney donor. The test can rule out that they have ADPKD and are therefore suitable to be a donor. What Is Autosomal Recessive Polycystic Kidney Disease (PKD)? Autosomal recessive PKD is caused by a particular genetic flaw that is different from the genetic flaw that causes autosomal dominant PKD. Parents who do not have the disease can have a child with the disease if both parents carry the abnormal gene and both pass the gene to their baby. The chance of this happening (when both parents carry the abnormal gene) is one in four. If only one parent carries the abnormal gene, the baby cannot get the disease. The symptoms of autosomal recessive PKD can begin before birth, so it is often called "infantile PKD." Children born with autosomal recessive PKD usually develop kidney failure within a few years. Severity of the disease varies. Babies with the worst cases die hours or days after birth. Children with an infantile version may have sufficient renal function for normal activities for a few years. People with the juvenile version may live into their teens and twenties and usually will have liver problems as well. 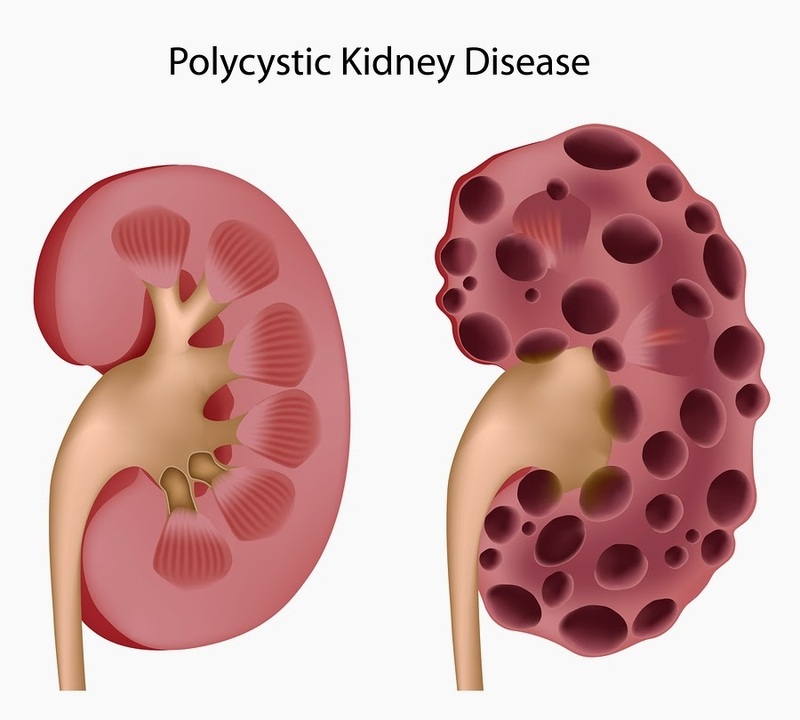 What Are the Symptoms of Autosomal Recessive Polycystic Kidney Disease (PKD)? Children with autosomal recessive PKD experience high blood pressure, urinary tract infections, and frequent urination. The disease usually affects the liver, spleen, and pancreas, resulting in low blood-cell counts, varicose veins, and hemorrhoids. Because kidney function is crucial for early physical development, children with autosomal recessive PKD are usually smaller than average size. How Is Autosomal Recessive Polycystic Kidney Disease (PKD) Diagnosed? Ultrasound imaging of the fetus or newborn baby reveals cysts in the kidneys but does not distinguish between the cysts of autosomal recessive and autosomal dominant PKD. Ultrasound examination of kidneys of relatives can be helpful; for example, a parent or grandparent with autosomal dominant PKD cysts could help confirm diagnosis of autosomal dominant PKD in a fetus or child. (It is extremely rare, although not impossible, for a person with autosomal recessive PKD to become a parent.) Because autosomal recessive PKD tends to scar the liver, ultrasound imaging of the liver also aids in diagnosis. How Is Autosomal Recessive Polycystic Kidney Disease (PKD) Treated? Medicines can control high blood pressure in autosomal recessive PKD, and antibiotics can control urinary tract infections. Eating increased amounts of nutritious food improves growth in children with autosomal recessive PKD. In some cases, growth hormones are used. In response to kidney failure, autosomal recessive PKD patients must receive dialysis or transplantation. Genes are segments of DNA, the long molecules that reside in the nuclei of your body's cells. The genes, through complex processes, cause chemical activities that lead to growth and maintenance of the body. At conception, DNA (and therefore genes) from both parents are passed to the child. A genetic disease occurs when one or both parents pass abnormal genes to a child at conception. If receiving an abnormal gene from just one parent is enough to produce a disease in the child, the disease is said to have dominant inheritance. If receiving abnormal genes from both parents is needed to produce disease in the child, the disease is said to be recessive. The chance of acquiring a dominant disease (one gene copy is enough) is higher than the chance of acquiring a recessive disease (two gene copies are needed). A child who receives only one gene copy for a recessive disease at conception will not develop the genetic disease (such as autosomal recessive PKD), but could pass the gene to the following generation. Scientists have begun to identify the processes that trigger formation of PKD cysts. Advances in the field of genetics have increased our understanding of the abnormal genes responsible for autosomal dominant and autosomal recessive PKD. Scientists have located two genes associated with autosomal dominant PKD. The first was located in 1985 on chromosome 16 and labeled PKD1. PKD2 was localized to chromosome 4 in 1993. Within 3 years, the scientists had isolated the proteins these two genes produce--polycystin-1 and polycystin-2. When both of these genes are normal, the proteins they produce work together to foster normal kidney development and inhibit cyst formation. A mutation in either PKD1 or PKD2 can lead to cyst formation, but evidence suggests that the disease development also requires other factors, in addition to the mutation in one of the PKD genes. Researchers recently identified the autosomal recessive PKD gene (called PKHD1) on chromosome 6. A genetic test kit is not yet commercially available to detect mutations in PKHD1. Researchers have bred mice with a genetic disease that parallels both inherited forms of human PKD. Studying these mice will lead to greater understanding of the genetic and nongenetic mechanisms involved in cyst formation. In 2000, scientists reported that a cancer drug was successful in inhibiting cyst formation in mice with the PKD gene. The scientists hope that further testing will lead to safe and effective treatments for humans. A common form that usually causes symptoms in midlife. A rare form that usually causes symptoms in early childhood. A noninherited form associated with long-term kidney problems, dialysis, and old age.